The newest of the Monte Carlo line, the MC6, is coming to U.S. shores for the Fort Lauderdale International Boat Show 2015. 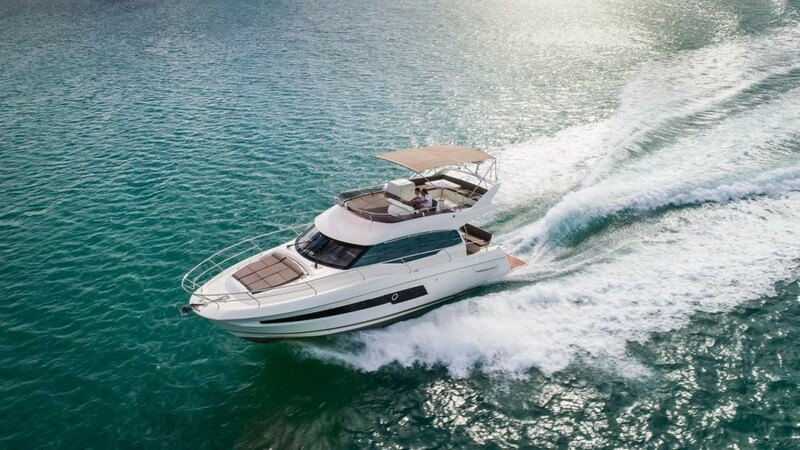 The Monte Carlo line was created by Beneteau Power to fill the gap between the Gran Turismo designs and Monte Carlo Yachts, which starts with the Monte Carlo Yachts 65, and will soon reach up to 105 feet. The similarity in names causes some confusion. While the MC line does benefit from some trickle-down features from above, it is a distinct offering that is finding a lucrative market. 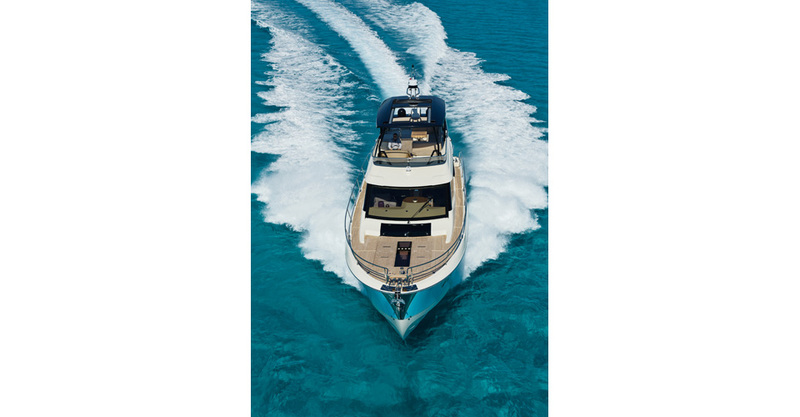 The MC6 has a distinctive blunt bow with a deep V that gives way to hard chines that define the aft sections. Like the previously launched MC5 and the MC4, the newest design arrived at the docks in Palma de Mallorca with the trademark turquoise hull color that adds style and disguises some of her significant freeboard. The naval architects created a beamy, balsa-cored hull with a bow that flares up dramatically from the waterline and creates significant volume where the interior is luxe and the living is easy. The MC6 is made for outdoor entertaining, with three separate areas where you can lounge with a book or enjoy a cocktail. Whether forward, aft, or up top, there’s always a place to socialize. On the bow, two chaise lounges rise up from the teak-covered deck with the touch of a button on a keyfob. They emerge slowly and electrically into Z-shaped seats with support for the upper body and at the knees. A transparent section of deck that looks down onto the VIP berth holds cup holders. Just toss on the custom cushions, grab a drink, and relax. It may sound gimmicky until you see it work—then it just tempts you to try it out. Another getaway is at the aft end where there’s a built-in galley with a Kenyon grill, sink, and prep area where the cook stands atop the hydraulic platform. This feature will be standard equipment on U.S. models. The thick transom also provides access to an optional captain’s cabin (with a head, sink, and bunk) or a garage. 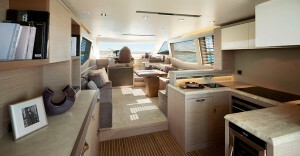 The first model of the MC6 is the flybridge version. Teak-covered steps lead up from the cockpit to a large U-shaped settee that wraps around a folding table. A second optional galley module with a sink and electric Kenyon grill is amidships. Forward, there’s a lounge that also serves as the companion seat across the helm to port. Here, a single helm seat sits behind a dash that includes a single multifunction display, a joystick, various systems and engine controls, and a compass. A T-top with an electric retractable sunroof covers most of the seating, and the reverse windshield keeps the helmsman dry. The striking difference on the flybridge from the two smaller models is the addition of the vast aft sunpad, which sits low so it benefits from wind protection and is quite private. It’s a perfect place to while away the hours in a marina or at anchor. 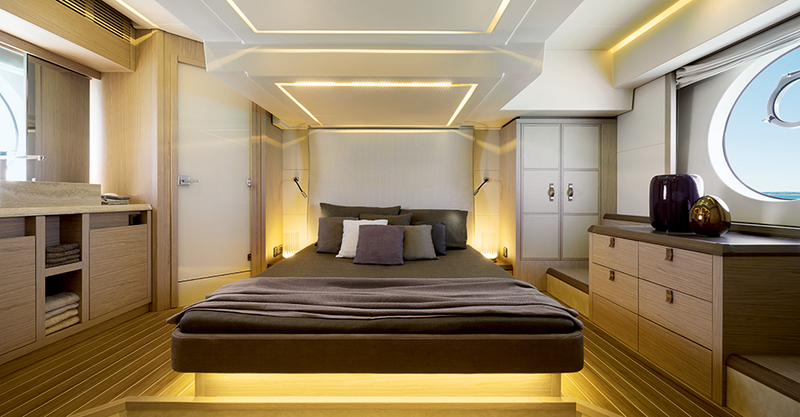 Inside, the MC6 gives a nod to the yacht line just above it with luxurious accommodations. Like the MC5, this new flagship offers three cabins but with one more head and extra space for a less cramped feel. The full-beam master suite has a large berth with padded headboard for good sound attenuation and excellent headroom all around, so there’s no need to stoop anywhere in the well-lit room. A full tower of drawers is to port and a head with a separate shower compartment is to starboard. 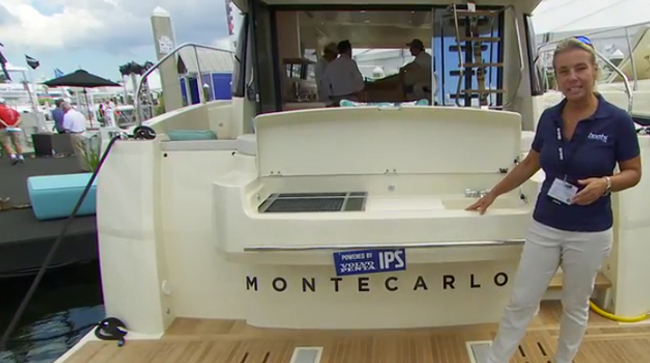 In between and out in the open, our test boat had a large, rectangular travertine sink. Giant fixed round hull ports on both sides with embedded opening round ports add light and air and also provide the distinguishing hull feature visible from the outside. The unique windows create trademark aesthetics on the MC6, but they also serve their function well. The VIP cabin is forward with a queen size midline berth that may be split by picking up the ends of the bed and sliding them outward to create two bunks. An en-suite head with shower stall is to port. An opening overhead hatch sits just aft of that large non-opening deck “window” that, you may remember, divides the chaise lounges up top. A day head is shared by the second and third cabins; in the third two side-by-side bunks slide together to form one large berth. Across from this cabin is a washer/dryer combination below the steps that lead up to the saloon. The main deck is where the socializing really shines. The galley is all the way aft so it’s easy to serve anyone in the cockpit or saloon. The U-shaped kitchen offers home-like amenities with an electric cooktop, an overhead fan, an optional wine chiller, and a food prep/bar station that also holds up to three refrigeration drawers. Upgrades to travertine countertops in the galley (and heads) add a sumptuous effect, which goes beyond the ordinary on this class of vessel. Fabric and leather surfaces combine with the brushed-oak finish for an alluring combination of color and texture inside the MC6. The elongated saloon features a straight settee to port and a large dinette to starboard. A 40” LED television pops up from a cabinet that also divides the living area from the bridge, where there’s a double companion seat and the helm. The command pod (and there’s no other word for it) is the star of the interior. Poised front and center, this is the feature that sells the boat. The single, leather chair is the focus of the helm station, with two flared armrests that allow the captain full control with a joystick on the right and a trackball on the left. Just ahead, our test boat had a single 24” Simrad multifunction display that toggled easily between navigation screens, engine information, and even a rearview camera feed. (Two 16” screens are standard.) Visibility is good forward but aft, the corners are obscured so the option is either a rearview camera or a third helm station in the cockpit. 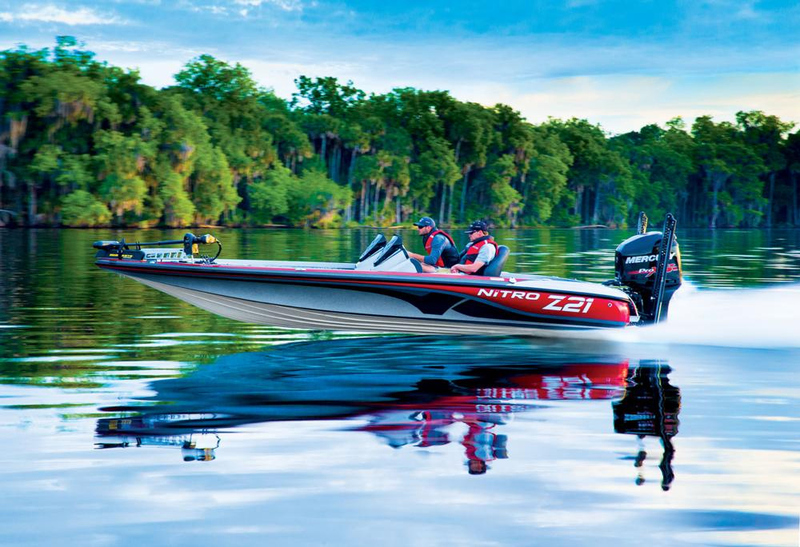 The quiet ride and supreme maneuverability of the MC6 is due to twin pod drives, which sit far aft in the boat, keeping noise and vibration away from the living area. The engines, twin 600 HP Cummins, are fairly efficient. Cruising the Bay of Palma, our best cruise was around 20 to 21 knots at 2500 RPM. At wide-open throttle and 3080 RPM we reached 26.4 knots. The hull, with its deep V and gull-wing-like shape, slices through the water and the decks remain dry. Flat chines aft kept rolling to a minimum even when quartering our own wake. There’s quite a bit of freeboard so windage in a tight docking situation may be a factor, but the pods and an optional bowthruster will help. With nearly 600 gallons of fuel, the MC6 will have a range of around 300 nautical miles at a cruising speed of 22 to 23 knots and still have a 20-percent fuel reserve for emergencies. 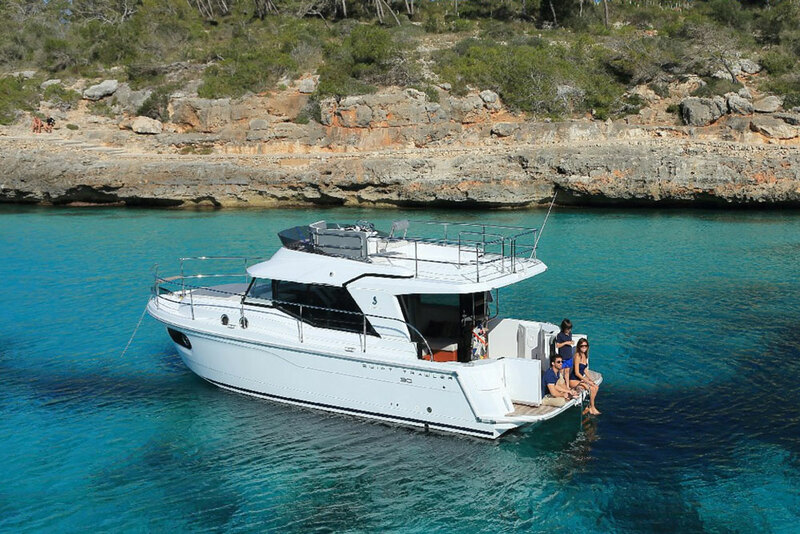 With its three social areas, the MC6 will make a fine day-boat but is also a competent coastal cruiser that can cover a lot of ground. Our test boat had already plied the coastal Atlantic on its way from France to Mallorca in the Mediterranean. Like the two smaller designs, the MC6 carries a dinghy on the swim platform and the suggested model is the Williams Tender 325 jet boat, although most any RIB will fit. Because many owners want a tender but also a PWC, this powerful jet boat does double duty while taking up only a fraction of the space needed to carry both. 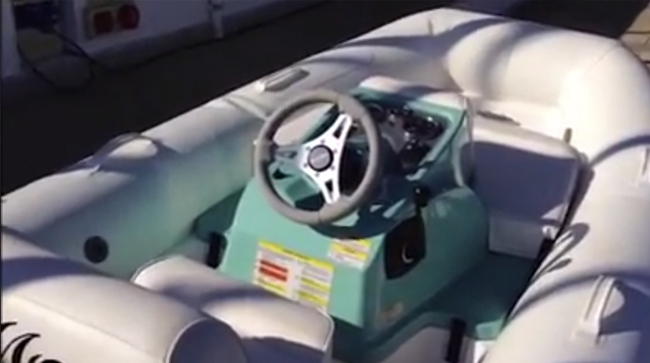 The fiberglass-bottom tender has 80 HP and can reach 35 to 40 knots. At over $40,000 it’s not inexpensive, but you do get two amenities for the price of one. 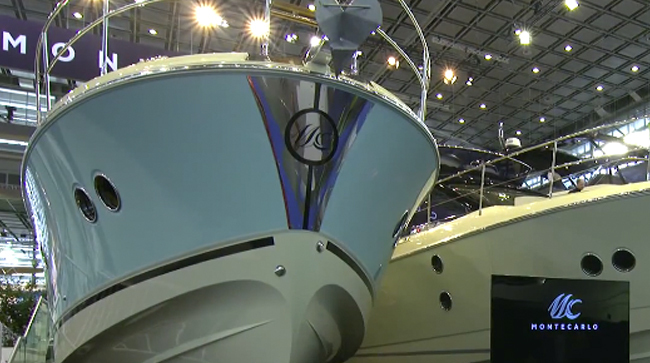 The MC6 destined for the U.S. has a few extra features but otherwise is the same vessel as is offered in Europe. There will be a Far East version that moves the galley down to where the third cabin is and makes the VIP stateroom into a second saloon. This layout leaves just a bar area on the main deck with larger dinette for large group entertaining. 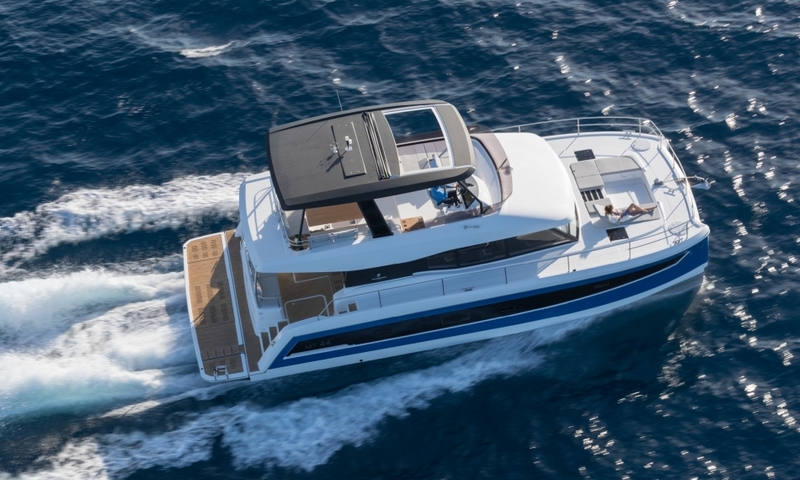 Beneteau’s strategy is to price the base boat attractively and then offer three trim level packages (Advantage, Elegance and Exclusive) to bundle popular features. Additional individual options are available beyond the three tiers. The base price of the MC6 is $1,350,000. With the Elegance package and other options including Seakeeper gyro-stabilization, you can expect to come in just under two million dollars. The Monte Carlo line is now fleshed out with models in three lengths. 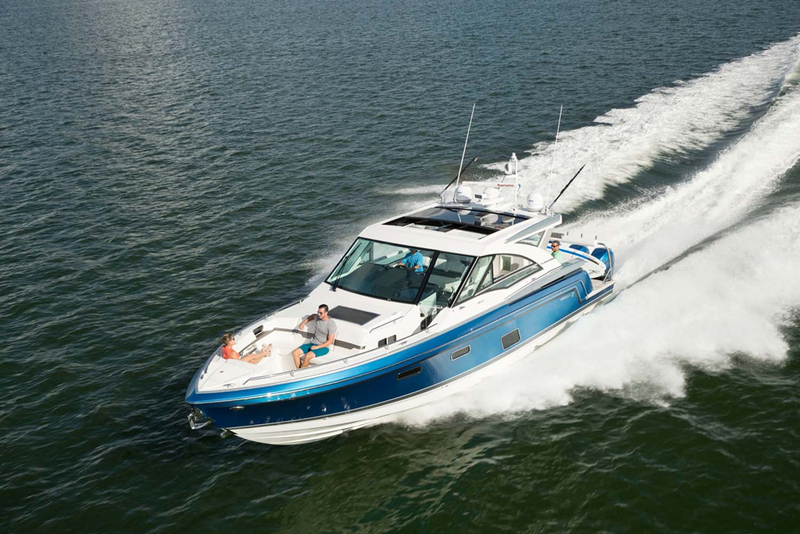 The MC4 and MC5 also offer sedan versions, minus the flybridge. This edition of the MC6 will make its debut in the U.S. soon, and I’m sure this easy-living platform will be hotly anticipated. Other Choices: The Princess 60 is another high-end motoryacht that runs in similar waters. Same goes for the slightly smaller Fairline Squadron 58, and for a more traditional look and performance, look at the Fleming 58.